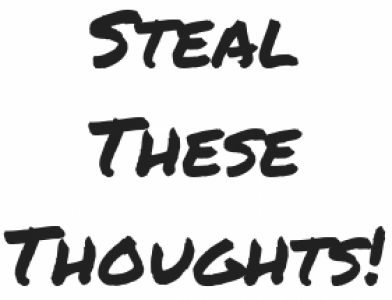 advice – Steal These Thoughts! I’m sure we’ve all heard the saying ‘You are the sum of the 5 people around you’. It’s a good point to reflect on, just like the media and food we allow ourselves to consume, the company we keep is of utmost importance too. Those around us, whether you realise it or not, have the effect to influence your behaviour, thoughts and beliefs. So if you have a bunch of negative people around you, high chance you will be too and if you’re around lots of happy people, same thing. Choosing the people you allow into your inner circle is probably the most important task you can complete. These interactions will setup how you see life and tackle impending challenges. But make sure you seek balance within your little tribe, seek voices from all corners, with different experiences and different views. You can’t appreciate what being happy and positive is all about if you don’t know about sorrow and negativity. To be aware and continue to understand, to evolve, you need views from all angles of life. Always evaluate your inner circle and if it’s still healthy for you. I’m sure a few of you have heard of Tony Robbins at some point. He’s kind of a self-help/life coach to CEO’s, actors, musicians and even a few presidents. If you Google Tony Robbins, you’ll find lots of his work, books, documentaries and events available to view online. I find walking to be a powerful tool for clearing my mind, gaining perspective and stimulating those creative juices. It’s actually a great remedy for a host of things from writers block to cooling down after a emotional conversation. Walking has a charm which allows me to reset, find clarity and calm those anxieties that we can all face. It’s a free form of therapy that can change your day and calm the thoughts in your head too. So next time, when in doubt or lost – take a walk and let those worries fade away. I find many times in life, especially in the variety of challenges and curveballs that are thrown our way – that the only way to get out of our problems and challenges is through them. Facing your problems and challenges, instead of running from them is normally the only way to overcome them and grow. Take if from someone who deals with a fair share of their own demons daily. Running and hiding from challenges and problems only makes it worse, yet finding the courage to say screw it and face what’s in front of you head on, will change your outlook on what you can do. Next time life throws something your way, just remind yourself – the only way out is through.